This calculator will calculate the time and interest you will save if you switch from making monthly mortgage payments to paying 1/2 of your mortgage payment -- plus an extra amount -- every 2 weeks. The results include a side-by-side comparison of monthly vs bi-weekly payoff timeframes and interest costs, plus a button for creating a printer friendly report with optional biweekly amortization schedule. Enter the current balance owed on your mortgage (call lender and ask for the current payoff amount). Enter the annual percentage rate (APR) of the mortgage. Enter as a percentage (for .06, enter 6%). Enter your current monthly mortgage principal and interest payment (don't include any insurance and tax portions that may be built into the payment). Select the month, day, and year that your next mortgage payment is due. Enter an amount you can afford to add to each biweekly mortgage payment, but without the dollar sign and any commas. Tap the text for a description of each row result. The first column shows how much your monthly principal and interest payment will be. The second column shows how much your biweekly payment will be (1/2 of your monthly payment, plus extra amount). The third column is not applicable since payments are made at different time intervals. The first column shows how many months it will take to pay off the mortgage when making monthly payments. The second column shows how many months it will take you to pay off the mortgage when making biweekly payments. The third column will show you how many months sooner you will pay off the mortgage by making biweekly payments instead of monthly payments. The first column shows how much interest you will pay if you pay off the mortgage by making monthly payments. The second column shows how much interest you will pay if you pay off the mortgage by making biweekly payments. The third column will show you how much interest you will save by making biweekly payments instead of monthly payments. The first column displays estimated payoff month and year if you continue making monthly payments. The second column displays the estimated payoff month, day, and year if you switch to making biweekly mortgage payments. The third column is not applicable. This free online calculator was created in response to numerous requests asking for the ability to add an extra or overpayment to each of the biweekly mortgage payments. The calculator will calculate the time and interest savings that will occur if you switch from making monthly mortgage payments to paying 1/2 of your mortgage payment -- plus an overpayment amount -- every two weeks (equivalent of 13 monthly payments per year instead of 12). The results include a monthly vs. biweekly side-by-side comparison of the payoff time frames, the interest costs, and the estimated payoff dates. And finally, the biweekly extra mortgage payment calculator on this page also includes a printer friendly report, which can include an optional biweekly mortgage amortization schedule. If you're not sure what a biweekly early payoff plan is, or what you need to watch out for, or how to double your savings, please visit the original Biweekly Mortgage Payment Calculator to read answers to those questions. Enter the mortgage's current principal balance owed. Enter the annual interest rate of the mortgage. Enter the current monthly payment amount. Select the month, day, and year indicating the date your next monthly mortgage payment is due. Enter an extra amount you can afford to add to each biweekly payment. 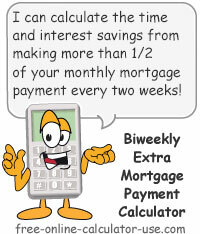 Tap the "Calculate Biweekly SavingsCalculate Biweekly Pmt SavingsCalculate Bi-weekly Payment SavingsCalculate Bi-weekly Extra Payment Savings" button. This will populate the payment comparison chart and display a button for opening a printer friendly report in a new window.